Star Mark Ruffalo: Film is "its own world"
(CNN) -- "Wolverine." "Star Trek." "Angels & Demons." "Terminator: Salvation." The summer movies roll out, one weekend after another, like dreadnoughts leaving port to bombard a battle-scarred ocean. 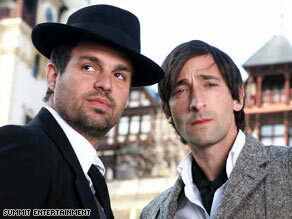 Mark Ruffalo and Adrien Brody star as "The Brothers Bloom," a pair of successful con artists. So won't a little film about a pair of con-artist brothers, with nary an indestructible alloy in sight, get overrun by these blockbusters? Rian Johnson, the 35-year-old director of the charming "The Brothers Bloom," doesn't see it that way. "I actually kind of like it," he says of the strategy of premiering his film during summer movie season. ("Bloom" opens Friday in limited release and expands nationwide May 29.) "I feel like we're scampering in between the feet of these giants." Make no mistake, adds Johnson: "I love the big summer movies." But, he says, audiences will see the big movie of the week "and then want something different. That's the advantage coming out in this season has." The film started earning buzz at the Toronto Film Festival last September, and its distributor, Summit Entertainment, launched a shrewd marketing campaign by putting the first seven minutes on the Internet earlier this year. Johnson, who directed the critically acclaimed "Brick" -- a film noir set in a high school -- has been praised for another inventive mix of genres, combining the con-man film with a touch of screwball comedy, some international intrigue and more than a little whimsy. Mark Ruffalo, who stars as Stephen Bloom, the mastermind of the duo, describes "Brothers Bloom" as "its own world." "What I loved about it was its tonal shifts," he says. "It goes from broad, almost slapstick stuff to the brother story and a love story. It's not traditional in that sense." The film follows Stephen Bloom and his brother, played by Adrien Brody, as they embark on one last con: an attempt to swindle a wealthy shut-in, Penelope Stamp, played by Rachel Weisz. Instead of being upset, Penelope is tickled by the new world before her and the opportunities for freedom, even as the younger Bloom (simply called "Bloom") wants to move on to something else. Johnson is nothing if not a student of film, and "Bloom" features references to other con-man works. "Paper Moon," with its examination of character, was a favorite, says Johnson. There are also nods to "The Sting," David Mamet's works, and even Agatha Christie. Add Johnson's invocations of Fellini's "8½," Marcello Mastroianni and (of all things) the Band documentary "The Last Waltz" to his cast, and Ruffalo says it was easy to find the film's personality. "That was the starting point -- a threadbare elegance," he says. That can be a lot for the moviegoing public of today -- weaned on CGI, armored rogues and thin romantic comedies -- to take in. But Johnson says he has faith "The Brothers Bloom" will find an audience. "I'm pretty optimistic that with ... the ease with which media is now archived and made available to the public, I'm hoping that actually opens the doors for people to have more access to this stuff," he says. The director maintains a message board at rcjohnso.com, where young filmmakers "constantly talk about older films," he says. In the film, Stephen Bloom says the perfect con is one in which "everyone gets what they want." Johnson (and his studio) hopes for a financial success, of course, but he couldn't be happier with the way "The Brothers Bloom" turned out. "I learned so much doing this film," he says. "It's like I got paid to go to grad school."